Bred by Noel J. Hynds of Autumfire Reg’d. The English Cocker Spaniel is the original Cocker Spaniel developed in Wales and Southwest England as a gundog. Cocker Spaniels were named for their ability to flush and retrieve game from dense undergrowth. The breed was imported to North America in the 1880s. 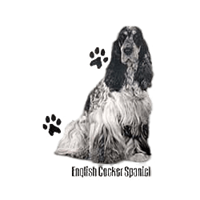 The English Cocker Spaniel is larger, both in height and weight, than the American Cocker Spaniel. He also has a longer muzzle, flatter head and less prominent eyes. He has a long, silky coat of medium-length that is either flat or slightly wavy. His coat colour can be either black, red, liver, golden, black and tan, tri-colour or roan in blue, liver, red, orange or lemon. He is noted for his intelligence and happy disposition, as well as being energetic, playful, affectionate, and eager to please. He enjoys family life and, as an active sporting dog, he needs regular exercise. English Cockers are seen participating in several dog sports and activities, including: Conformation, Obedience, Agility, Field Trials, Tracking, and Flyball. In addition, their friendly and gentle disposition make them ideal to work as Therapy Dogs. Familial Nephropathy (FN) This is a hereditary, fatal kidney disease in young Cocker Spaniels. For more information, see Familial Nephropathy. The English Cocker Spaniel’s coat consists of long guard-hairs on top of a soft undercoat. Grooming styles vary based on purpose. For showing purposes, the coat is generally stripped by hand or with a stripping knife; the face and top of the ears are clipped; the feathering is cut so as not to drag on the ground; and the hair on the feet is trimmed. The nails should be kept trimmed and teeth brushed with dog toothpaste. The ears must be kept clean to avoid infection and should be cleaned weekly. English Cocker Spaniel Rainbow of Colors — One of the most appealing things about the English Cocker Spaniel, as a breed, are the varieties of colors in which they come. Is That A Labradoodle? — A must read article regarding the mixed-breed “Doodles” and “Poos”. These are not exotic new breeds!